Thankfully I get to have a bit of rest for the next few days after a busy three days on the road, Ascot then Huntingdon then Hereford. I'd forgotten how arduous that last 20 miles from Worcester into Hereford is, and the journey back was even slower! My weekend is on the main piece, plus today's big-priced selection from Wolverhampton. Saturday morning, 6.30am, and off goes the alarm for what promises to be a full weekend on the road. First off, Ascot with Daren, for what looks a very good card, and hopefully business should be good, despite Ascot charging £29 to get in today. An uneventful journey down means we get there in plenty of time and there's ample time to nip to the Ascot Cafe on the high street for breakfast baguettes (the good lady has travelled down with us for a day out as well). Get the value with the sausage and bacon baguette for £4.20 is the advice, you'll not go hungry. Earlier in the week Daren had paid the princely sum of £47 to stand at Fakenham in the silver ring. If only he could pay something like that today, as not only is the bookmakers badge 6 x the admission price, but as it's the first Ascot jumps fixture the new marketing fee is due. 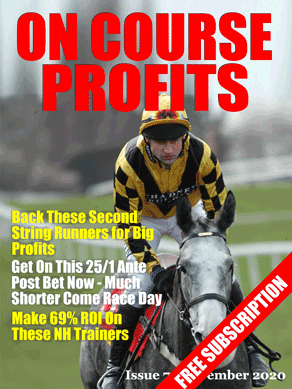 The marketing fee is paid to the courses yearly to promote betting with the bookmakers. Allegedly. Ever seen the courses promote the bookies? Rarely if ever, I'd say. So it's another tax on bookmakers, in effect. By the time we're in (adding on petrol, my admission as a worker and other expenses) you're already the best part of £400 down before we've even set up! We stand on the front row, and business is slow to get going. Which is a shame, as we could have done with someone coming in with a lump on the odds-on Pym, especially once it gets beat. How the winner, Anemoi, has won after some dreadful jumps mid-race, is a mystery, but it's a small winning race. Business picks up, and we realise that there's plenty of families here for the fireworks later. Throw in the fact that the kids rides were all free as well and the £29 admission isn't bad value at all. As such, there's plenty of £2 e/w's about and both Chequered View and Atomic Rumble prove popular. In fact, a group of lads have some good bets on the latter – £50 e/w, £25 e/w and £30 win, and it becomes our loser. We have little to worry about as it's nearer last than first, and despite New Quay going off favourite and is an easy winner, it's a good winning race for us. But we're about to suffer a reversal as Wenyerreadyfreddie is very well backed, the price collapsing late on from 2-1 to 6-4. It's alreayd a loser in the book when, just as they are lining up, we take a £500 bet for it. Daren stands the majority of it and it's clear from halfway that he's going to win. The profits of the first couple are wiped out and it's back to square one. We can't give Shantou Rock away in the next, Champagne At Tara is the only one the want and the favourite is a winner in out book. That, sadly, lasts all of 10 seconds after the off as poor Shantou Rock suffers an injury at the first fence. Vosne Romanee wins but as we are paying out, the klaxon goes for a stewards enquiry. They are looking into whether the correct procedures have been followed in the way the horses have gone around one of the dolled-off fences. We've already paid a lot out and a void race now would be a disaster. And I was halfway through paying another guy £160 when the klaxon went. I politely give him his ticket back and tell him he'll now have to wait. Thankfully for him, the race result stands after ten nerve-wracking minutes (for us all!) and he gets his money. Business is good now and there are small queues. Lots of small money but it's all adding up. Fidux in the next is okay but not brilliant, but Traffic Fluide is a disaster – plenty of twenties and forties for him and the roar as he gets back up past Art Mauresque, who is reaching for the oxygen tanks after the last, is deafening. I run out of twenties paying out. Going into the last, including expenses, we're on the losing side of things. And if Fubar wins then things will be well and truly Fubar, as it's the one they want, and we take some good three-figure bets on him. Going into the final furlong he's well beaten and it's just a matter of how much we win – amazingly 3-1 Emitom, who wins, is a better result that the second, Ben Buie. Time to set off back for home – and after expenses, Daren wins the princely sum of….£70 for himself. Huntingdon on Sunday. The least said about this the better. We have three pitches, two on the rails and one in the ring, and we're having communication problems between the three of them. All three should be linked up but that's not the case and it's proving problematical. It's another family day (although there's a beer festival on) and there's an Irish band playing. Sadly it's not Squinty McGinty, the King Of The Irish Bands, but the uninspiring named The Wild Murphys. There must be a factory somewhere churning these bands out. Weirdly, from where I'm stood, a lot of the songs they play sound the same. Do I need to tell you how the afternoon went when there were five winning favourites and a well-backed second favourite all going in? The highlights of the day include – Jackthejourneyman, a good winner in the book, packing up 100 yards from the line when five lengths clear and having the race in the bag to finishing third, a bloke having £100 on the first winner Lazarus and then playing much of his winnings up on every favourite after that, and a woman asking me for – and I am not kidding here – £5 ew on the 1-10 shot Le Breuil in the 2 horse race. Here's the joke, readers – after explaining to her that she can't bet e/w in a match, she has a fiver win on it instead. I tell her I'll see her later for her 50p profit but, as I type this, she's yet to pick up her winnings. Maybe she's kept the docket as a souvenir. Or perhaps she thinks she's lost. The total loss at the end of the day is not a good one – suffice to say it's well into four figures. We've had better weekends, for sure. Never mind, always Nottingham on Wednesday…. Haldon Gold Cup day at Exeter today but as a betting contest it makes very little appeal and I'm happy to look elsewhere for a bet. In fact, it's to Wolverhampton I go and I cannot resist an e/w bet on King Oswald in the 2.50 at 40-1 (4 places) with Paddy Power here. There are enough positives – on a winning mark, trip and surface both fine, to make him of interest anyway, but he actually ran okay when eighth of nine here last week, travelling well at the rear and only beaten 2l at the death. He's a bit of a kidder, which is a worry, but he could easily go close in a really weak race here. As usual David a fascinating insight into the life of a small bookmaker, I had to chuckle at the £5e/w on the 1/10 shot. I wonder if you will ever see that lady again? I always thought every bookmaker was loaded but all that work for £70 clear profit, certainly not on that day. Keep the story’s coming David there great!